If you ever doubted that God exists, meet the very technical, highly engineered dromedary camel. 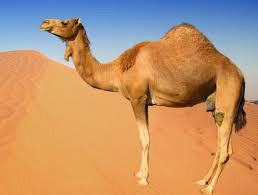 I'm a dromedary camel, the one-hump kind that lives on hot deserts in the Middle East. My hump, all eighty pounds of it, is filled with fat-my body fuel-not water, as some people believe. My Mighty Maker gave it to me because He knew I wouldn't always be able to find food. When I'm hungry, I'll eat almost anything- A leather bridle, a piece of rope, my master's tent, or a pair of shoes. My mouth is so tough a thorny cactus doesn't bother it. I love to chow down grass and other plants that grow here on the Arabian Desert. As I travel across the hot sands, when I don't find any chow, my body automatically takes fat from the hump, feeds my system, and keeps me going strong. This is my emergency food supply. If I cannot find any plants to munch, my body uses up my hump. When the hump gets smaller, it starts to tip to one side. But, when I get to a nice oasis and begin to eat again, my hump soon builds back to normal. I've been known to drink twenty-seven gallons of water in ten minutes. My Master Designer made me in such a fantastic way that in a matter of minutes all the water I've swallowed travels to the billions of microscopic cells that make up my flesh. Naturally, the water I swallow first goes into my stomach. There, thirsty blood vessels absorb and carry it to every part of my body. Scientists have tested my stomach and found it empty ten minutes after I've drunk twenty gallons. In an eight-hour day, I can carry a four hundred pound load 100 miles across a hot, dry desert and not stop once for a drink or something to eat. In fact, I've been known to go eight days without a drink, but then I look a wreck. I lose 227 pounds, my ribs show through my skin, and I look terribly skinny. But, I feel great! After I find a water hole, I'll drink for about ten minutes and my skinny body starts to change almost immediately. In that short time my body fills out nicely, I don't look skinny anymore. I’ve gained back the 227 pounds I lost. I look thin because the billions of cells lose their water. They're no longer fat. They're flat. Normally my blood contains 94% water, just like yours. But When I can't cannot find any water to drink, the heat of the sun gradually robs a little water out of my blood. Scientists have found that my blood can lose up to 40% of its water, and I'm still healthy. Doctor's Doctors say human blood has to stay very close to 94% water. If you lose 5% of it, you can't see anymore; 10%, you can't hear and you go insane; 12%, your blood is as thick as molasses and your heart can't pump the thick stuff. It stops and you're dead. That's not true with me because scientists say my blood is different. My red cells are elongated. Yours are round. Maybe that's what makes the difference. This proves I'm designed for the desert, or the desert is designed for me. Have you ever heard of a design without a designer? Even though I lose a lot of water on the desert, my body conserves it too. Way in the beginning when my intelligent engineer made me, he gave me a specially designed nose that saves water. When I exhale, I don't lose much. My nose traps that warm, moist air from my lungs and absorbs it in my nasal membranes. Tiny blood vessels in those membranes take that back into my blood. How's that for a recycling system? It works because my nose is cool. My cool nose changes that warm moisture in the air from my lungs into water when I breathe in hot dry desert air and it goes through my wet nasal passages. This produces a cooling effect, and my nose stays as much as 18 degrees cooler than the rest of my body. Sometimes a big windstorm comes out of nowhere, bringing flying sand with it. My Master Designer put special muscles in my nostrils that close the openings keeping sand out of my nose but still allowing me enough air to breathe. My eyelashes arch down over my eyes like screens, keeping the sand and sun out but still letting me see clearly. If a grain of sand slips through and gets in my eye, the Creator took care of that too. He gave me an inner eyelid that automatically wipes the sand off my eyeball just like a windshield wiper. Some people think I'm conceited because I always walk around with my head held high and my nose in the air. However, that's just because of the way I'm made. My eyebrows are so thick and bushy I have to hold my head high to peek out from underneath them. I'm glad I have them though. They shade my eyes from the bright sun. Desert people depend on me for many things. Not only am I their best form of transportation, but I'm also their grocery store. Mrs. Camel gives very rich milk that people make into butter and cheese. I shed my thick fur coat once a year, year and that can be woven into cloth. A few young camels are used for beef, (beef? That’s a cow. Wouldn’t meat be better?) but I don't like to talk about that. For a long time we camels have been called the "ships of the desert" because of the way we sway from side to side when we trot. Some of our riders get seasick. I sway from side to side because of the way my legs work. Both legs on one side move forward at the same time, elevating that side. My "left, right, left, right" motion makes my rider feel like he is in a rocking chair going sideways. When I was six months old, special kneepads started to grow on my front legs. The intelligent Creator knew I had to have them. They help me lower my 1000 pounds to the ground. If I didn't have them, my knees would soon become sore and infected, and I could never lie down. I'd die of exhaustion. By the way, I don't get thick kneepads because I fall on my knees. I fall on my knees because I already have these tough pads. Someone very great thought of me and knew I needed them. He designed them into my genes. It's real difficult for me to understand how some people say I evolved into what I now am. I'm a very technical, highly engineered dromedary camel. Things like me don't just happen. They're planned on a drawing board by someone very brilliant, someone very logical.